The second country is one of Latin America’s most impoverished nations and its newest dictatorship. Its schools lie half deserted. The health system has been devastated by decades of underinvestment, corruption, and neglect; long-vanquished diseases, such as malaria and measles, have returned. Only a tiny elite can afford enough to eat. An epidemic of violence has made it one of the most murderous countries in the world. It is the source of Latin America’s largest refugee migration in a generation, with millions of citizens fleeing in the last few years alone. Hardly anyone (aside from other autocratic governments) recognizes its sham elections, and the small portion of the media not under direct state control still follows the official line for fear of reprisals. By the end of 2018, its economy will have shrunk by about half in the last five years. It is a major cocaine-trafficking hub, and key power brokers in its political elite have been indicted in the United States on drug charges. Prices double every 25 days. The main airport is largely deserted, used by just a handful of holdout airlines bringing few passengers to and from the outside world. These two countries are in fact the same country, Venezuela, at two different times: the early 1970s and today. The transformation Venezuela has undergone is so radical, so complete, and so total that it is hard to believe it took place without a war. What happened to Venezuela? How did things go so wrong? The short answer is Chavismo. Under the leadership of Hugo Chávez and his successor, Nicolás Maduro, the country has experienced a toxic mix of wantonly destructive policy, escalating authoritarianism, and kleptocracy, all under a level of Cuban influence that often resembles an occupation. Any one of these features would have created huge problems on its own. All of them together hatched a catastrophe. Today, Venezuela is a poor country and a failed and criminalized state run by an autocrat beholden to a foreign power. The remaining options for reversing this situation are slim; the risk now is that hopelessness will push Venezuelans to consider supporting dangerous measures, such as a U.S.-led military invasion, that could make a bad situation worse. To many observers, the explanation for Venezuela’s predicament is simple: under Chávez, the country caught a strong case of socialism, and all its subsequent disasters stem from that original sin. But Argentina, Brazil, Chile, Ecuador, Nicaragua, and Uruguay have also elected socialist governments in the last 20 years. Although each has struggled politically and economically, none—aside from Nicaragua—has imploded. Instead, several have prospered. If socialism cannot be blamed for Venezuela’s demise, perhaps oil is the culprit. The most calamitous stage of Venezuela’s crisis has coincided neatly with the sharp fall in international oil prices that started in 2014. But this explanation is also insufficient. Venezuela’s decline began four decades ago, not four years ago. By 2003, Venezuela’s GDP per worker had already declined by a disastrous 37 percent from its 1978 peak—precisely the decline that first propelled Chávez into office. Moreover, all of the world’s petrostates suffered a serious income shock in 2014 as a result of plummeting oil prices. Only Venezuela could not withstand the pressure. The drivers of Venezuela’s failure run deeper. Decades of gradual economic decline opened the way for Chávez, a charismatic demagogue wedded to an outdated ideology, to take power and establish a corrupt autocracy modeled on and beholden to Cuba’s dictatorship. Although the crisis preceded Chávez’s rise to power, his legacy and Cuba’s influence must be at the center of any attempt to explain it. Chávez was born in 1954 into a lower-middle-class family in a rural town. He became a career military officer on a baseball scholarship and was soon secretly recruited into a small leftist movement that spent over a decade plotting to overthrow the democratic regime. He exploded into Venezuela’s national consciousness on February 4, 1992, when he led an unsuccessful coup attempt. This misadventure landed him in jail but turned him into an improbable folk hero who embodied growing frustration with a decade of economic stagnation. After receiving a pardon, he launched an outsider bid for the presidency in 1998 and won in a landslide, upending the two-party system that had anchored Venezuelan democracy for 40 years. Chávez was brilliant at mining discontent. What drove the explosion of populist anger that brought Chávez to power? In a word, disappointment. The stellar economic performance Venezuela had experienced for five decades leading up to the 1970s had run out of steam, and the path to the middle class had begun to narrow. As the economists Ricardo Hausmann and Francisco Rodríguez noted, “By 1970 Venezuela had become the richest country in Latin America and one of the twenty richest countries in the world, with a per capita GDP higher than Spain, Greece, and Israel and only 13 percent lower than that of the United Kingdom.” But by the early 1980s, a weakened oil market had brought the era of fast growth to an end. Lower oil revenue meant cuts in public spending, scaled-down social programs, currency devaluation, runaway inflation, a banking crisis, and mounting unemployment and hardship for the poor. Even so, Venezuela’s head start was such that when Chávez was elected, it had a per capita income in the region that was second only to Argentina’s. Another common explanation for Chávez’s rise holds that it was driven by voters’ reaction against economic inequality, which was driven in turn by pervasive corruption. But when Chávez came to power, income was more evenly distributed in Venezuela than in any neighboring country. If inequality determined electoral outcomes, then a Chávez-like candidate would have been more probable in Brazil, Chile, or Colombia, where the gap between the well-off and everyone else was larger. Venezuela may not have been collapsing in 1998, but it had been stagnating and, in some respects, backsliding, as oil prices slumped to just $11 per barrel, leading to a new round of austerity. Chávez was brilliant at mining the resulting discontent. His eloquent denunciations of inequality, exclusion, poverty, corruption, and the entrenched political elite struck a chord with struggling voters, who felt nostalgic for an earlier, more prosperous period. The inept and complacent traditional political and business elite who opposed Chávez never came close to matching his popular touch. Venezuelans gambled on Chávez. What they got was not just an outsider bent on upending the status quo but also a Latin American leftist icon who soon had followers all around the world. Chávez became both a spoiler and the star attraction at global summits, as well as a leader of the burgeoning global wave of anti-American sentiment sparked by U.S. President George W. Bush’s invasion of Iraq. At home, shaped by his career in the military, Chávez had a penchant for centralizing power and a profound intolerance of dissent. He set out to neuter not just opposition politicians but also political allies who dared question his policies. His collaborators quickly saw which way the wind was blowing: policy debates disappeared, and the government pursued a radical agenda with little forethought and no real scrutiny. A 2001 presidential decree on land reform, which Chávez handed down with no consultation or debate, was a taste of things to come. It broke up large commercial farms and turned them over to peasant cooperatives that lacked the technical know-how, management skills, or access to capital to produce at scale. Food production collapsed. And in sector after sector, the Chávez government enacted similarly self-defeating policies. It expropriated foreign-owned oil ventures without compensation and gave them to political appointees who lacked the technical expertise to run them. It nationalized utilities and the main telecommunications operator, leaving Venezuela with chronic water and electricity shortages and some of the slowest Internet connection speeds in the world. It seized steel companies, causing production to fall from 480,000 metric tons per month before nationalization, in 2008, to effectively nothing today. Similar results followed the seizure of aluminum companies, mining firms, hotels, and airlines. The relationship between Cuba and Venezuela became more than an alliance. In one expropriated company after another, state administrators stripped assets and loaded payrolls with Chávez cronies. When they inevitably ran into financial problems, they appealed to the government, which was able to bail them out. By 2004, oil prices had spiked again, filling government coffers with petrodollars, which Chávez spent without constraints, controls, or accountability. On top of that were the easy loans from China, which was happy to extend credit to Venezuela in exchange for a guaranteed supply of crude oil. By importing whatever the hollowed-out Venezuelan economy failed to produce and borrowing to finance a consumption boom, Chávez was able to temporarily shield the public from the impact of his disastrous policies and to retain substantial popularity. But not everyone was convinced. Oil industry workers were among the first to sound the alarm about Chávez’s authoritarian tendencies. They went on strike in 2002 and 2003, demanding a new presidential election. In response to the protests, Chávez fired almost half of the work force in the state-run oil company and imposed an arcane currency-exchange-control regime. The system morphed into a cesspool of corruption, as regime cronies realized that arbitraging between the state-authorized exchange rate and the black market could yield fortunes overnight. This arbitrage racket created an extraordinarily wealthy elite of government-connected kleptocrats. As this budding kleptocracy perfected the art of siphoning off oil proceeds into its own pockets, Venezuelan store shelves grew bare. It was all painfully predictable—and widely predicted. But the louder local and international experts sounded the alarm, the more the government clung to its agenda. To Chávez, dire warnings from technocrats were a sign that the revolution was on the right track. In 2011, Chávez was diagnosed with cancer. Top oncologists in Brazil and the United States offered to treat him. But he opted instead to search for a cure in Cuba, the country he trusted not only to treat him but also to be discreet about his condition. As his illness progressed, his dependence on Havana deepened, and the mystery about the real state of his health grew. On December 8, 2012, an ailing Chávez made one final television appearance to ask Venezuelans to make Maduro, then vice president, his successor. For the next three months, Venezuela was governed spectrally and by remote control: decrees emanated from Havana bearing Chávez’s signature, but no one saw him, and speculation was rife that he had already died. 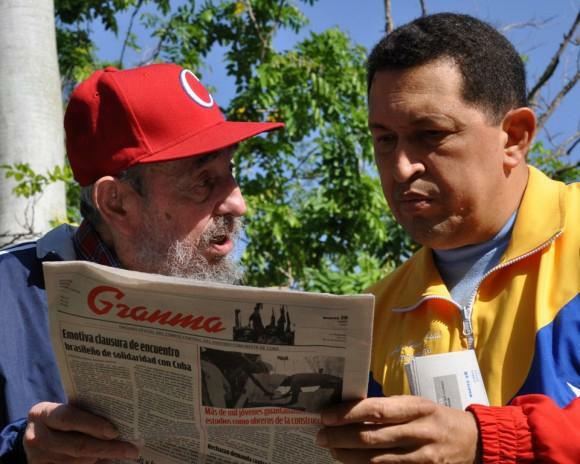 When Chávez’s death was finally announced, on March 5, 2013, the only thing that was clear amid the atmosphere of secrecy and concealment was that Venezuela’s next leader would carry on the tradition of Cuban influence. Chávez had long looked to Cuba as a blueprint for revolution, and he turned to Cuban President Fidel Castro for advice at critical junctures. In return, Venezuela sent oil: energy aid to Cuba (in the form of 115,000 barrels a day sold at a deep discount) was worth nearly $1 billion a year to Havana. The relationship between Cuba and Venezuela became more than an alliance. It has been, as Chávez himself once put it, “a merger of two revolutions.” (Unusually, the senior partner in the alliance is poorer and smaller than the junior partner—but so much more competent that it dominates the relationship.) Cuba is careful to keep its footprint light: it conducts most of its consultations in Havana rather than Caracas. It did not escape anyone’s attention that the leader Chávez annointed to succeed him had devoted his life to the cause of Cuban communism. As a teenager, Maduro joined a fringe pro-Cuban Marxist party in Caracas. In his 20s, instead of going to university, he sought training in Havana’s school for international cadres to become a professional revolutionary. As Chávez’s foreign minister from 2006 to 2013, he had seldom called attention to himself: only his unfailing loyalty to Chávez, and to Cuba, propelled his ascent to the top. Under his leadership, Cuba’s influence in Venezuela has become pervasive. He has stacked key government posts with activists trained in Cuban organizations, and Cubans have come to occupy sensitive roles within the Venezuelan regime. The daily intelligence briefs Maduro consumes, for instance, are produced not by Venezuelans but by Cuban intelligence officers. With Cuban guidance, Maduro has deeply curtailed economic freedoms and erased all remaining traces of liberalism from the country’s politics and institutions. He has continued and expanded Chávez’s practice of jailing, exiling, or banning from political life opposition leaders who became too popular or hard to co-opt. Julio Borges, a key opposition leader, fled into exile to avoid being jailed, and Leopoldo López, the opposition’s most charismatic leader, has been moved back and forth between a military prison and house arrest. Over 100 political prisoners linger in jails, and reports of torture are common. Periodic elections have become farcical, and the government has stripped the opposition-controlled National Assembly of all powers. Maduro has deepened Venezuela’s alliances with a number of anti-American and anti-Western regimes, turning to Russia for weapons, cybersecurity, and expertise in oil production; to China for financing and infrastructure; to Belarus for homebuilding; and to Iran for car production. As Maduro broke the last remaining links in Venezuela’s traditional alliances with Washington and other Latin American democracies, he lost access to sound economic advice. He dismissed the consensus of economists from across the political spectrum: although they warned about inflation, Maduro chose to rely on the advice of Cuba and fringe Marxist policy advisers who assured him that there would be no consequences to making up budget shortfalls with freshly minted money. Inevitably, a devastating bout of hyperinflation ensued. A toxic combination of Cuban influence, runaway corruption, the dismantling of democratic checks and balances, and sheer incompetence has kept Venezuela locked into catastrophic economic policies. As monthly inflation rates top three digits, the government improvises policy responses that are bound to make the situation even worse. Nearly all oil-producing liberal democracies, such as Norway, the United Kingdom, and the United States, were democracies before they became oil producers. Autocracies that have found oil, such as Angola, Brunei, Iran, and Russia, have been unable to make the leap to liberal democracy. For four decades, Venezuela seemed to have miraculously beat these odds—it democratized and liberalized in 1958, decades after finding oil. But the roots of Venezuelan liberal democracy turned out to be shallow. Two decades of bad economics decimated the popularity of the traditional political parties, and a charismatic demagogue, riding the wave of an oil boom, stepped into the breach. Under these unusual conditions, he was able to sweep away the whole structure of democratic checks and balances in just a few years. When the decadelong oil price boom ended in 2014, Venezuela lost not just the oil revenue on which Chávez’s popularity and international influence had depended but also access to foreign credit markets. This left the country with a massive debt overhang: the loans taken out during the oil boom still had to be serviced, although from a much-reduced income stream. Venezuela ended up with politics that are typical of autocracies that discover oil: a predatory, extractive oligarchy that ignores regular people as long they stay quiet and that violently suppresses them when they protest. The resulting crisis is morphing into the worst humanitarian disaster in memory in the Western Hemisphere. Exact figures for Venezuela’s GDP collapse are notoriously difficult to come by, but economists estimate that it is comparable to the 40 percent contraction of Syria’s GDP since 2012, following the outbreak of its devastating civil war. Hyperinflation has reached one million percent per year, pushing 61 percent of Venezuelans to live in extreme poverty, with 89 percent of those surveyed saying they do not have the money to buy enough food for their families and 64 percent reporting they have lost an average of 11 kilograms (about 24 pounds) in body weight due to hunger. About ten percent of the population—2.6 million Venezuelans—have fled to neighboring countries. The Venezuelan state has mostly given up on providing public services such as health care, education, and even policing; heavy-handed, repressive violence is the final thing left that Venezuelans can rely on the public sector to consistently deliver. In the face of mass protests in 2014 and 2017, the government responded with thousands of arrests, brutal beatings and torture, and the killing of over 130 protesters. Meanwhile, criminal business is increasingly conducted not in defiance of the state, or even simply in cahoots with the state, but directly through it. Drug trafficking has emerged alongside oil production and currency arbitrage as a key source of profits to those close to the ruling elite, with high-ranking officials and members of the president’s family facing narcotics charges in the United States. A small connected elite has also stolen national assets to a unprecedented degree. In August, a series of regime-connected businessmen were indicted in U.S. federal courts for attempting to launder over $1.2 billion in illegally obtained funds—just one of a dizzying array of illegal scams that are part of the looting of Venezuela. The entire southeastern quadrant of the country has become an exploitative illegal mining camp, where desperate people displaced from cities by hunger try their luck in unsafe mines run by criminal gangs under military protection. All over the country, prison gangs, working in partnership with government security forces, run lucrative extortion rackets that make them the de facto civil -authority. The offices of the Treasury, the central bank, and the national oil company have become laboratories where complicated financial crimes are hatched. As Venezuela’s economy has collapsed, the lines separating the state from criminal enterprises have all but disappeared. 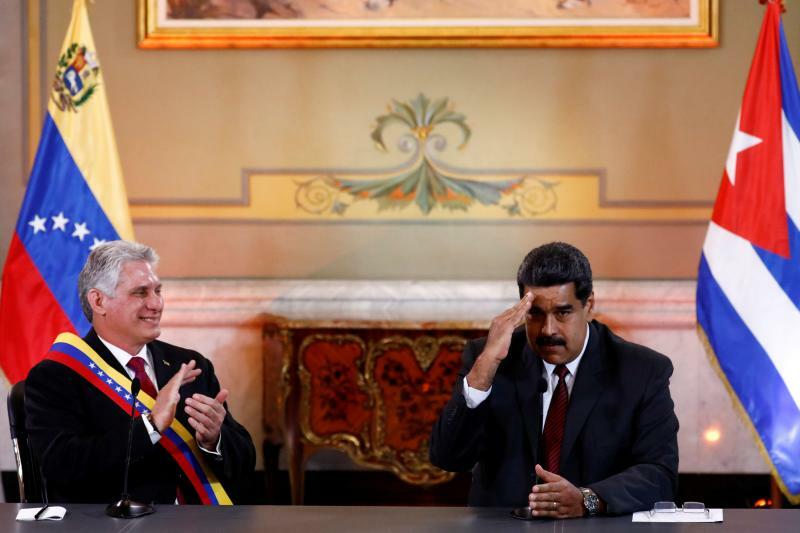 Whenever U.S. President Donald Trump meets with a Latin American leader, he insists that the region do something about the Venezuelan crisis. Trump has prodded his own national security team for “strong” alternatives, at one point stating that there are “many options” for Venezuela and that he is “not going to rule out the military option.” Republican Senator Marco Rubio of Florida has similarly flirted with a military response. 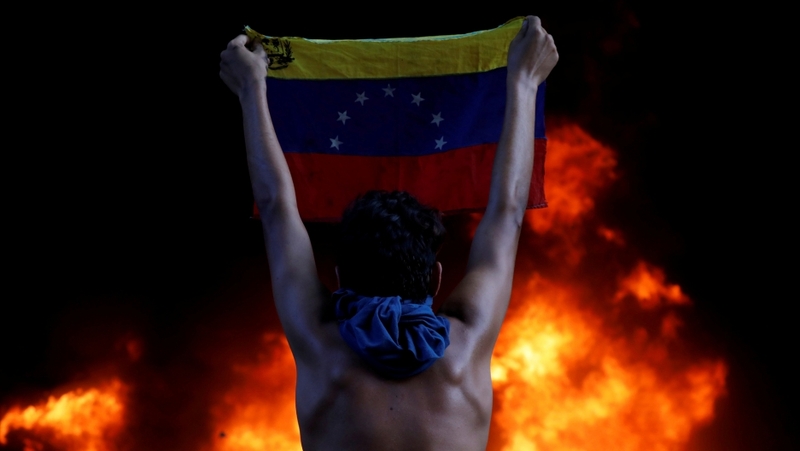 Secretary of Defense James Mattis, however, has echoed a common sentiment of the U.S. security apparatus by publicly stating, “The Venezuelan crisis is not a military matter.” All of Venezuela’s neighboring countries have also voiced their opposition to an armed attack on Venezuela. And rightly so. Trump’s fantasies of military invasion are deeply misguided and extremely dangerous. Although a U.S.-led military assault would likely have no problem overthrowing Maduro in short order, what comes next could be far worse, as the Iraqis and the Libyans know only too well: when outside powers overthrow autocrats sitting atop failing states, open-ended chaos is much more likely to follow than stability—let alone democracy. Nonetheless, the United States will continue to face pressure to find some way of arresting Venezuela’s collapse. Each initiative undertaken so far has served only to highlight that there is, in reality, little the United States can do. During the Obama administration, U.S. diplomats attempted to engage the regime directly. But negotiations proved futile. Maduro used internationally mediated talks to neutralize massive street protests: protest leaders would call off demonstrations during the talks, but Chavista negotiators would only stonewall, parceling out minor concessions designed to divide their opponents while they themselves prepared for the next wave of repression. The United States and Venezuela’s neighbors seem to have finally grasped that, as things stand, negotiations only play into Maduro’s hands. The other Latin American countries are finally grasping that Venezuela’s instability will inevitably spill across their borders. Some have suggested using harsh economic sanctions to pressure Maduro to step down. The United States has tried this. It passed several rounds of sanctions, under both the Obama and Trump administrations, to prevent the regime from issuing new debt and to hamper the financial operation of the state-owned oil company. Together with Canada and the EU, Washington has also put in place sanctions against specific regime officials, freezing their assets abroad and imposing travel restrictions. But such measures are redundant: if the task is to destroy the Venezuelan economy, no set of sanctions will be as effective as the regime itself. The same is true for an oil blockade: oil production is already in a free fall. Washington can sharpen its policy on the margins. For one thing, it needs to put more emphasis on a Cuban track: little can be achieved without Havana’s help, meaning that Venezuela needs to be front and center in every contact Washington and its allies have with Havana. The United States can cast a wider net in countering corruption, preventing not just crooked officials but also their frontmen and families from enjoying the fruits of corruption, drug trafficking, and embezzlement. 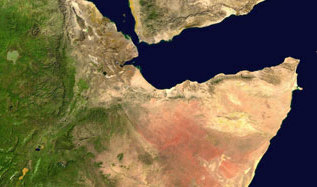 It could also work to turn the existing U.S. arms embargo into a global one. The Maduro regime must be constrained in its authoritarian intent with policies that communicate clearly to its cronies that continuing to aid the regime will leave them isolated in Venezuela and that turning on the regime is, therefore, the only way out. Yet the prospects of such a strategy succeeding are dim. After a long period of dithering, the other Latin American countries are finally grasping that Venezuela’s instability will inevitably spill across their borders. As the center-left “pink wave” of the early years of this century recedes, a new cohort of more conservative leaders in Argentina, Brazil, Chile, Colombia, and Peru has tipped the regional balance against Venezuela’s dictatorship, but the lack of actionable options bedevils them, as well. Traditional diplomacy hasn’t worked and has even backfired. But so has pressure. For example, in 2017, Latin American countries threatened to suspend Venezuela’s membership in the Organization of American States. The regime responded by withdrawing from the organization unilaterally, displaying just how little it cares about traditional diplomatic pressure. 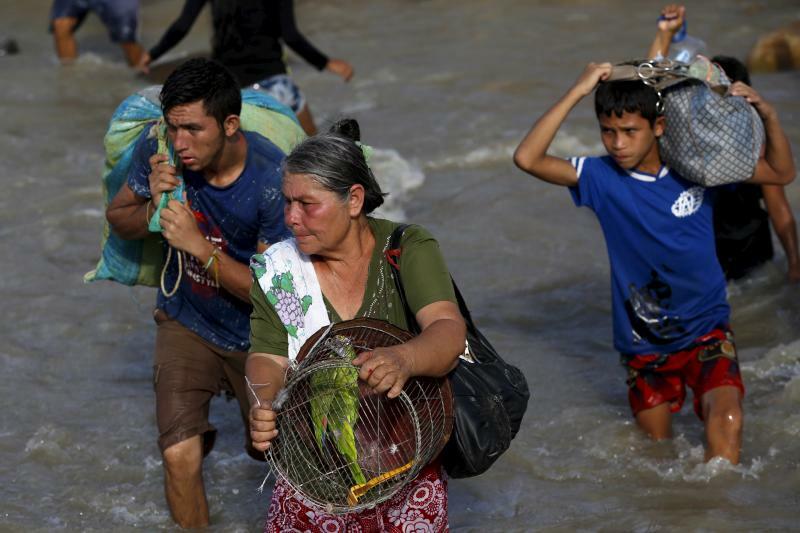 Venezuela’s exasperated neighbors are increasingly seeing the crisis through the prism of the refugee problem it has created; they are anxious to stem the flow of malnourished people fleeing Venezuela and placing new strains on their social programs. As a populist backlash builds against the influx of Venezuelan refugees, some Latin American countries appear tempted to slam the door shut—a temptation they must resist, as it would be a historic mistake that would only worsen the crisis. The reality is that Latin American countries have no idea what to do about Venezuela. There may be nothing they can do, save accepting refugees, which will at least help alleviate the suffering of the Venezuelan people. Today, the regime is so solidly entrenched that a change of faces is much more likely than a change of system. Perhaps Maduro will be pushed out by a slightly less incompetent leader who is able to render Cuban hegemony in Venezuela more sustainable. Such an outcome would merely mean a more stable foreign-dominated petro-kleptocracy, not a return to democracy. And even if opposition forces—or a U.S.-led armed attack—somehow managed to replace Maduro with an entirely new government, the agenda would be daunting. A successor regime would need to reduce the enormous role the military plays in all areas of the public sector. It would have to start from scratch in restoring basic services in health care, education, and law enforcement. It would have to rebuild the oil industry and stimulate growth in other economic sectors. It would need to get rid of the drug dealers, prison racketeers, predatory miners, wealthy criminal financiers, and extortionists who have latched on to every part of the state. And it would have to make all these changes in the context of a toxic, anarchic political environment and a grave economic crisis. Given the scale of these obstacles, Venezuela is likely to remain unstable for a long time to come. The immediate challenge for its citizens and their leaders, as well as for the international community, is to contain the impact of the nation’s decline. For all the misery they have experienced, the Venezuelan people have never stopped struggling against misrule. As of this summer, Venezuelans were still staging hundreds of protests each month. Most of them are local, grass-roots affairs with little political leadership, but they show a people with the will to fight for themselves. Is that enough to nudge the country away from its current, grim path? Probably not. Hopelessness is driving more and more Venezuelans to fantasize about a Trump-led military intervention, which would offer a fervently desired deus ex machina for a long-suffering people. But this amounts to an ill-advised revenge fantasy, not a serious strategy. Rather than a military invasion, Venezuelans’ best hope is to ensure that the flickering embers of protest and social dissent are not extinguished and that resistance to dictatorship is sustained. Desperate though the prospect may seem, this tradition of protest could one day lay the foundations for the recovery of civic institutions and democratic practices. It won’t be simple, and it won’t be quick. Bringing a state back from the brink of failure never is.